Microservices allow companies to manage their monolithic applications more easily. There are many benefits to the “monolithic” application model - especially at the beginning of a project - but monoliths can become unwieldy over time, limiting companies’ ability to move quickly and flexibly in today’s dynamic business environment. While the concept of microservices is not new, it has become an essential part of the development process in today’s dynamically changing business environment. Each service has distinct boundaries and are interfaced through an API. Microservices enable a level of modularity that renders individual services quicker to develop, test and deploy and as a result, developers are able to work with services that are much easier to understand and maintain. One of the noted benefits from the microservice model is the ability for developers to focus on a single service rather than an entire monolithic application. This results in developers not being hindered by the technology or technologies used to build the original monolith, and they can choose the technology - and iterative timetable - that works best for the task at hand. Similarly, every service has its own database schema, which allows developers to use the type of database that is best for the service’s needs. 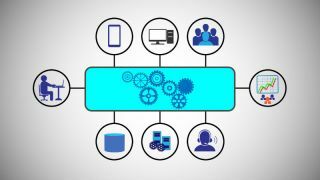 In the microservices model, applications are split into a small set of interconnected services based on business capability. Each service implements a set of distinct features—in effect, serving as a mini-application with its own business logic, adapters and even database schema. Services can be grouped together in different ways, with the sum of their parts serving as new products. With continuous delivery & integration, containers and DevOps, the pace of innovation on the web has increased dramatically and the concept of microservices is more important than ever. Each service has a well-defined boundary in the form of a RESTful, RPC- or message-driven API. The model enforces a level of modularity that makes individual services much faster to develop, and much easier to understand and maintain. Organizations should not forget the internal security of a microservices application. It is worthwhile to remain cognizant of the security threats brought on by other components in the application - even if they can be trusted now, there is no telling how the client base for the application will grow in the future. With most monolithic applications, there is a clean separation between the presentation logic on one side and the business and data-access logic on the other, including an API that can act as a seam. “Splitting” the application along this seam creates two smaller, more manageable applications. No matter what the company size or industry, if you are a developer today, you are likely working on one monolithic application or another--struggling to update, test and deploy what has become an overgrown, bloated blob of an app. As business demands grow more complex, so, too, do many of the applications used to drive and support business. And the more complex the application, the less sense it makes in a monolithic model. Microservices can help companies more effectively manage their monolithic applications. And, over time, once companies have converted enough modules to microservices, the monolith will cease to be an issue.